One of my oldest and dearest friends, Dellie, is now very, very pregnant. Back when she was just very pregnant, she and I spent a day cooking up a storm, filling a freezer with healthy, delicious meals in anticipation of a now not-so-little peanut that may or may not occupy most of her waking hours. By now you know that I'm a fly-by-the-seat-of-my-pants kind of cook. I shop without a clear agenda, and I frequently figure out what's for dinner by poking my head in the fridge when I get home from work and seeing what looks best. Not so with Dellie; she is the planner's planner. And in advance of our big cooking day, she had made a master spreadsheet listing every recipe we had chosen and the quantities of every ingredient they called for. She had visited three grocery stores to procure the items we needed. She'd even prepped a few key elements of dishes in advance, so we could hit the ground running as soon as I arrived. That woman, I tell you: she is a force. For those of you who are curious as to what we made, I'm sharing the list here. I think it's a fantastic starter list for folks looking to stockpile meals before the birth of a child or another big event. We picked things that freeze and reheat well, things that won't be too fussy to pop in the oven at the end of a busy day. We certainly weren't the first to fill up the freezer; Merrill Stubbs from Food 52 did the same thing before she had her beautiful daughter, Clara. She cooked a mix of one-pot meals and freezable components (like taco filling) that could be assembled with relative ease later on. We stuck mostly with the former, to make things as stress-free as possible. I left Dellie and Jeremy's house smelling intensely of meat (just ask the folks who picked me up - sorry guys! ), but knowing that D and J had at least a month's worth of meals, ready to go. Since no meal is complete without at least a little something sweet - and since parenthood means many late nights - we also made two trays of these granola bars to stow away. Yes, these granola bars are raw -- in the sense that you don't bake the bars - not in the sense that nothing has been heated. 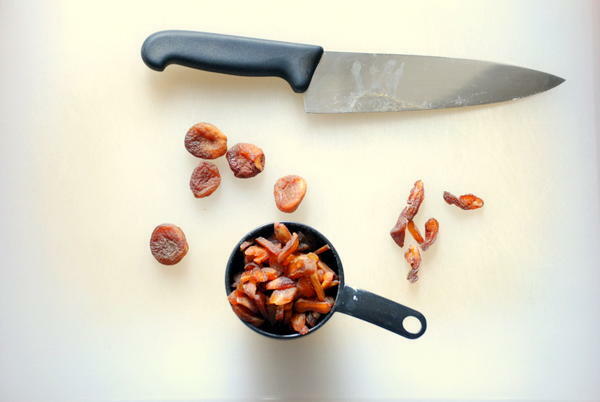 You actually toast most of the ingredients before mixing them, to amp up their flavor. 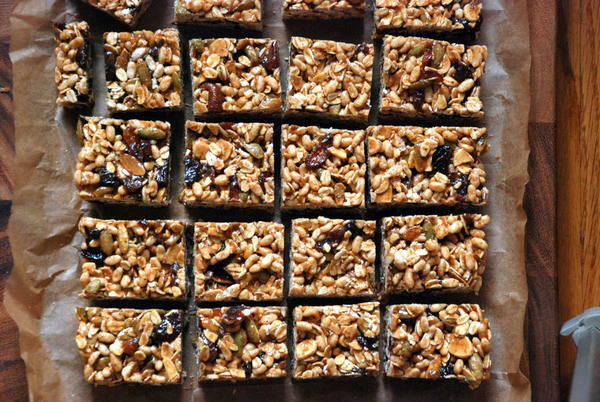 Raw or cooked, they're the best granola bars I've ever made (and I've made my fair share). Dell and I agreed that these granola bars were lighter and crunchier than others we'd made; puffed rice is the key. They also hold up to travel and time much better than my beloved raspberry bars or my other favorite granola bars. After licking the bowl at Dellie's, I got home and promptly made a pan for us. When my heavy travel kicked in, I packed up about 10 bars into a zip-top bag and tossed them into the bottom of my purse, where -- despite lots of banging around -- they stayed intact and delicious for two full weeks. I can't think of a better travel snack. Heat the oven to 350 degrees. Toast the oats, almonds, and pumpkin seeds. It's fine to put them all on the same pan, but make sure you separate them on the pan, so that when one is done, you can remove it and leave the others to continue toasting. The pumpkin seeds took about 7 minutes, the oats and almonds about 10 (though almonds will depend on how thinly they're sliced). When all the items are sufficiently toasted, toss them with the brown rice crispies, apricots, and cherries in a large bowl. In a small saucepan, heat the almond butter and honey just to get melty, not cooked. (This is your glue and if it boils or even comes close, it gets hard and impossible to stir once it cools.) Stir in the salt and cinnamon, then pour over the granola mixture and stir. You want to get everything mixed together and sticky without crushing the crispies. Turn the mixture into a 9x13 baking dish lined with parchment and press the mixture evenly and firmly, trying not crush the crispies too much. Cover with plastic wrap and refrigerate for several hours. Cut into 2-inch squares before serving.